Are you organising a wedding, party, or corporate event? Do you want to ensure that your guests are entertained by a professional, have a magical time and remember the event? 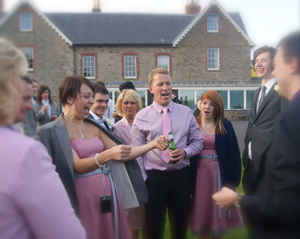 John is the perfect ice-breaker and will remove the worry of keeping your guests entertained, ensuring that everyone has a great time - he’ll guarantee that he’ll make your event unforgettable. John Parkin is a professional entertainer and a member of world famous Magic Circle, plus is a fully insured member of Equity, so you know your event is in safe hands. 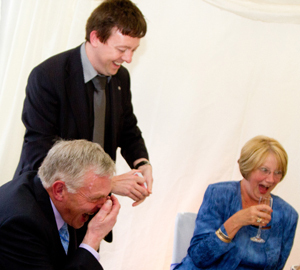 John’s amazing sleight of hand magic is performed right before your guests eyes, often in their own hands - placing them at the heart of the entertainment and creating memorable magical moments. John creates magic with cards, coins, borrowed items, every day objects and will read your guests minds with cutting edge psychological mind reading - undertaking impossible feats and even predicting the future! Contact John to discuss how he can tailor a unique package of magical entertainment that works in harmony with your Big Day or unique event. Make your event Memorable - Contact John Parkin today. 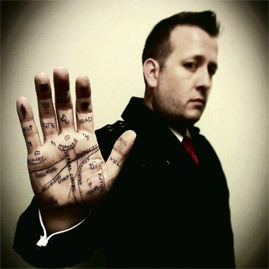 With over 20 years’ experience working as a Children’s Entertainer around the country, Paul decided to build on his growing reputation as a leading magician and Children’s entertainer and establish Magical Mayhem – a company created to offer a wide range of services – from weddings to corporate entertainment, children’s parties to youth groups, churches to schools. Paul is fully CRB (Criminal Records Bureau) checked and trained in Child Protection Policies to ensure a safe environment for children and peace of mind for parents. I am a full-time professional magician and mind reader with loads of performing experience in all kinds of situation and venues. I provide magic for corporate events such as exhibitions and seminars as well as weddings, parties and other social events. I am a past president of two magical societies and have won awards for my close-up and stage magic. Bernie performs his amazing, award winning, close up magic at many weddings and corporate events. He has been recommended on Chris Moyles Radio 1 show and has performed his mind blowing magic to Zoe Ball on BBC Television (her ring vanished only to reappear within the petals of a rose). Playing cards change in your hands, bank notes appear within a Kiwi. Bernie performs at corporate events and Trade shows. He is the Today Group magician and the recommended magician for The Belfry Hotel. See his website videos to see how your guests could be entertained and amazed. One of the U.K.'s Leading Children's Entertainers. The Yellow Haired Magic Man Full of Fun. Performing a mixture of Magic Puppets and Fun. Gary is an award winning, professional close-up magician from Buxton, in Derbyshire, whose work with a deck of playing cards is truly amazing. He is a dedicated, hard-working performer, which is reflected in the re-bookings, requests, recommendations and comments that he receives. He creates a positive atmosphere for his audiences, with his fast witted, light hearted approach and his confidence and control (which has come from performing at hundreds of venues, for thousands of people), provides a unique act, presented in a memorable performing style. Gary is a stunning magician, with a likable personality, who prides himself on giving the audience what they want- Quality Entertainment! His own blend of well-timed comedy and very strong magic, performed extremely naturally, provokes laughter and applause, at every table that he performs at, leaving his audiences in a complimentary mood. Although Gary promotes himself, primarily, as a close-up magician, his cabaret performances are very funny, very magical and very entertaining, and you would think that he had been performing solely as a stage magician, having seen his stage performances. Gary is a well respected magician, who continues to lecture on card magic, for magic circles. He has judged at magic competitions, run magic workshops, gives private tuition, and has recently ended a business, involving the demonstration and sale of magic, to focus his attention on performances. His performances at many venues, including Chatsworth House, Bridgewater Hall, Alton Towers (theme parks, hotels and conference centres), The Lowry Centre and various football clubs, has offered him a variety of audiences and situations, which shows in his quick thinking and versatility. Because he is a truly natural performer, who is reliable, recommendable, commercial and professional, but most importantly of all, because people remember where and when they saw Gary Williams. Gary came third in the Manchester Circle of Magicians Close-Up Championships-2008, and will be performing at the Blackpool convention, by invite, in the European Close-Up Championships-2009. So, if you don't book him, wish him luck. References given, if requested. Stuart and Jayne Safire are an award winning act. Since their inception hard work and enthusiasm has produced a breathtaking but amusing live show making them in great demand and gaining them the reputation as being one of the finest illusion acts in the country. Recently they won the title of The Most Entertaining Magical Act in the UK and were honoured to became Members of The Inner Magic Circle. Not only have Safire established themselves in the UK but have been fortunate enough to break through to success in the U.S.A some highlights of their career being to receive an invitation from world famous illusionists Siegfried and Roy to appear in their World Magic Show at the renowned Tropicana Hotel in Las Vegas and also performing at the 20th Century Fox Plaza Hotel in Los Angeles. When in Germany they were honoured to perform before Prince Luitipold of Bavaria and most recently in a Royal Variety Performance in the presence of HRH The Duke of Kent at The Prince of Wales Theatre in London’s West End appearing alongside Bradley Walsh, Claire Sweeney, Paul Zerdin, John Maloney, The Christians, Joe Tracini and leading cast members from London’s top musicals Hairspray, Wicked, Grease and Chicago. Performing at the largest theatres throughout the UK has given them the experience of performing with some of the top names in show business including Peter Kay, Ken Dodd, Jimmy Tarbuck, Richard Branson, Ricky Tomlinson, Billy Pearce, Cannon and Ball, Kim Wilde, Keith Harris , Freddie Starr, Danny La Rue, Wayne Dobson, Rory Bremner, Frank Carson, Jimmy Cricket, Phil Cool, Bobby Davro, The Grumbleweeds and have recently for the sixth time just finished touring UK theatres with BBC’s Chuckle Brothers. TV appearances have included Children’s ITV, Sooty, Talk of the Town and The Pyjama Party with Claudia Winkleman. They also have appeared on Granada TV’s Christmas Special with Noddy Holder and the cast of Coronation Street and three Chuckle Brothers DVD’s. Performing Close Up table magic and large scale illusions Safire’s corporate clients include Virgin, Barclaycard, Channel 4, Sky TV, Nat West, BUPA, Hilton, Jaguar and Mercedes where not only did they perform their act but actually appeared the car in the Showroom ! Stuart and Jayne also work as Illusion Consultants for Stage and TV.